I have written this Solo Build It! review to encourage my website visitors to use it to create an online business for themselves. It worked for me and gave my lifestyle a giant boost! Solo Build It is a system designed to help individual entrepreneurs succeed in the world of online business. It's far more than just a website builder; it's a complete web business building system with all the tools you will ever need. The system has been known in the past as SBI!, which stands for Site Build It! The recent name change was created to emphasize how the system helps a one person business succeed in the challenging world of online business. I discovered Solo Build It! at a time when I really needed big time help. My professional career and financial situation were in turmoil after the collapse of the real estate market in 2008. As a civil engineer, real estate broker, and developer there was not much opportunity to find a way to make a living in those dark days. Solo Build It! came to my rescue in 2009. I was told about it from a friend who had built a successful online business using SBI!. I learned it was an all in one web business system with online tools and a first rate educational system that would teach me what I needed to know and continually keep me up to date with industry trends and changes. Signing up was a no risk money back venture that turned into a lifesaver for me because even though I was at retirement age, I didn't have much income except for Social Security. I had built other websites in earlier years using free or cheap hosting services that provided WYSIWYG systems for creating content. That's an acronym for What You See Is What You Get. What I got was very low traffic and no income at all. I soon realized that anyone can start a website or blog, but those who make a living at it are few and far between. Solo Build It! cost more than the cheapo outfits - $299/year or $29.99/month - but it offered an Action Guide that told me everything I needed to know about building a profitable online business all by myself. It was like a college course - it is in fact taught in several colleges. The Action Guide is divided into 10 very thorough lesson plans called "days" but most days take a bit longer than a day to master. In fact, I still consult the Action Guide for information even though my web business has been up and running since 2009. The Action Guide showed me how to identify my interests and passions and to determine if there was a chance to make good income on the internet. My career in engineering and real estate took me all over Florida and I developed a love for Florida history and travel on the back roads. I wondered if there were a way to make an online business work by sharing my knowledge and interest in those subjects. 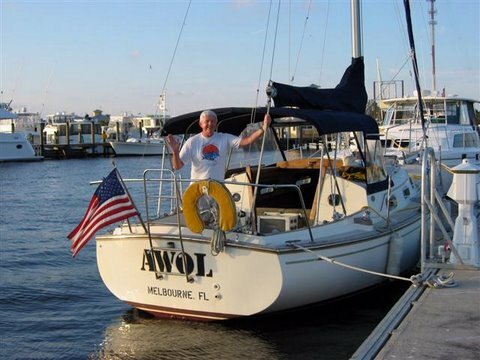 I had also lived on my boats several times and also wanted to explore if that experience could be turned into an online business. SBI! showed me there were people interested in those subjects. Site Build It! provided keyword search tools that showed me exactly what people were searching for on Google. Solo Build It! also analyzed the the topics to ensure they were potentially profitable. In other words, SBI! guided me every step of the way and since I was interested in my subjects, I had no trouble writing content. SBI! 's systems automatically analyzed my content and web pages and kept me on the right path. Whenever I need help or advice, SBI! is there with the most tremendous support system I've ever seen. With that kind of support and the additional help from forum members, I know everything I need to know about making an online business succeed. My first online business was Florida-Backroads-Travel.com followed a few years later by Living-Aboard.com. My cost of doing business is still only $299 per year for each site. I estimate that all of the tools SBI! gives me would cost about $3,800 per year if I bought them individually. They even developed a product called Solo Build It! for Wordpress that contains the same tools less the site builder for only $ 149 per year or $17 per month. Both products can be paid for monthly with no long term contract requirements. Click here to see the tools you get and how much they would cost bought individually without SBI!. Today Florida-Backroads-Travel.com receives more traffic than 99 percent of the websites in the world in terms of traffic, and the younger Living-Aboard.com is moving up quickly. I make a great living from my websites and from the many books I have created from their content. Even better, it is residual income that will survive me when I'm gone. Many hundreds if not thousands of Solo Build It! solopreneurs can make the same claim. In fact, solopreneurs who use Solo Build It! are 100 times more likely to succeed than other people who try to build an online business. Check it out. It is probably the answer you've been looking for. Be careful when you search the internet for Solo Built It! reviews or the other names it has been known by: SBI! and Site Build It!. There are many fake reviews on the internet by people paid by an SBI! competitor to write untrue and negative things to get you to pay for their poorly performing system. SBI! recently performed a study to test the claims made by these fake reviews and the competitor who pays for them. The study included thousands of websites from SBI! and thousands from the competitor. The study revealed that SBI! placed 33 times as many sites into the top brackets for traffic as the competitor. Click here to see the study. SBI!s motivation for this study was to combat the fake reviews and help steer people away from making a mistake. It's such a problem that it negatively affects legitimate businesses such as SBI! and misleads consumers in the worst way. To see the scope of the problem, do a Google search for "fake reviews". I built this successful website into a profitable business using the tools provided by SBI! I shudder to think where my business would be if I had gone with the phony competitor. This is why I wrote this Solo Build It! review: to help you make the right decision about your online business future. More Information About Solo Built It! If you are interested in learning more about SBI!, here are some links for your research. sitesell.com - SiteSell home page that gives you a good overview of the entire web business building process. results.sitesell.com - Shows you a list of 500 SBI! sites with traffic in the top 0.5% of all active websites in the world. tools.sitesell.com - A list of everything you get with a Solo Build! it subscription. If you subscribe to Solo Build It! from any of the above links or a display ad on this page, I receive a commission at no extra cost to you. Affiliate and advertising income supports this site, and gives me the resources to write about Florida backroads travel on a regular basis.